Leading global provider of security and safety solutions, Allegion, is showcasing the latest innovation in its aptiQTM range at IFSEC  an easy-to-use new mobile app, aptiQmobile, which boosts the simplicity and convenience of the technology. aptiQ is a series of multi-technology readers designed to simplify the transition from older security platforms, such as proximity 125 kHz, to smart technology. 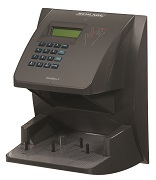 The range of electronic access control readers includes the ability to read a variety of contactless technology platforms, such as proximity, XceedID® MIFARE®, and aptiQTM MIFARE DESFireTM EV1 smart card. The readers are also Near Field Communication (NFC) compliant, giving users the ability to migrate to mobile credentials using the sptiQmobile app. To maintain the highest security levels, the aptiQTM reader allows mutually encrypted communication between the card, reader and diversified keys, which protect data integrity and prevent unauthorised access. Taking simplicity and convenience to the next level, aptiQmobile enables users to receive their card via an app downloaded to their smartphone. When credentials are assigned by the system administrator, the user is given a PIN which verifies their identity on downloading the aptiQmobile app. An encrypted mobile key is then sent to the smartphone. This quick and highly efficient process enables access credentials to be issued remotely in seconds. The aptiQTM series has been independently tested by Benchmark Magazine, a respected security industry magazine which puts advanced technologies to the test and provides information relating to the options and benefits. A security expert from Benchmark Magazine, who gave the aptiQTM a recommended status, said: For those seeking a gradual transition from a proximity-based access control system to one using smartcard technology, aptiQTM delivers another option with regard to reader hardware. Paul Taylor, Sales Leader for electronic access control products at Allegion, said: aptiQTM readers are a superior product from an aesthetic and technological point of view and the addition of the mobile app provides even greater simplicity and convenience with no compromise on safety and security. This product range is designed to provide installers with unique advantages over others available on the market today. Existing proximity systems can be expanded and upgraded to SMART technology with ease, whilst the simplified offering allows one reader to be carried to cover virtually all their maintenance requirements. The aptiQTM readers come in four contemporary designs with various colour options to complement a range of décors. Installation is made quick and easy using a simplified mounting bracket and a plug and go wiring harness which enables prewiring in new construction and allows for easy maintenance in the future. For more information about Allegion, please visit allegion.co.uk. 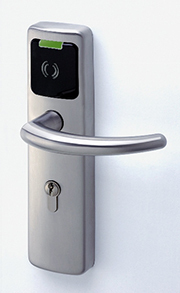 Leading global provider of security and safety solution, Allegion, presents the latest in reliable and convenient biometric technology with its Schlage Handkey II.